Immunizations protect us from serious and potentially fatal infections and diseases like polio, diphtheria, measles and rubella. Immunizations also make it harder for disease to spread, helping build a circle of protection around an entire community. 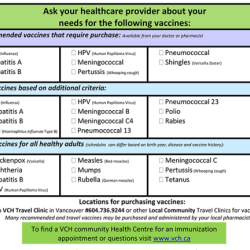 You can get free routine immunizations at many Vancouver Coastal Health clinics and community health centres. Your family doctor can also provide immunizations. Travel and additional vaccines for purchase are available through travel clinics and most pharmacies. 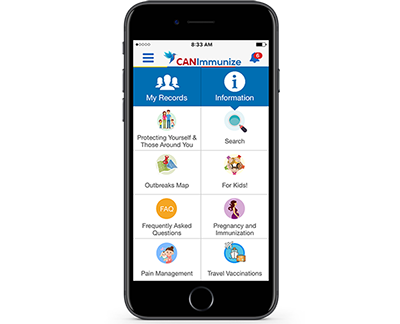 The latest news and resources to stay safe from vaccine-preventable diseases. Please complete and return this form when registering your child for a child care facility. 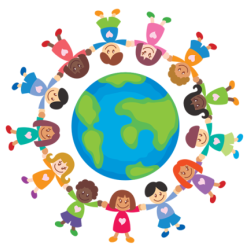 Key websites and links to get protection from vaccine-preventable diseases. Download our simplified schedules or visit HealthLinkBC and ImmunizeBC for all ages and details. Keep track of your or your child's immunizations. It's an important record to keep for life. All BC children are offered free vaccine protection against many harmful vaccine-preventable diseases. 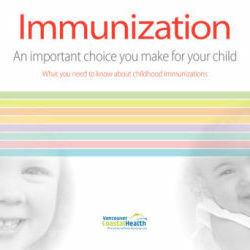 This brochure gives answers to all your immunization questions, and why its an importance choice for your child. Just Moved Here? 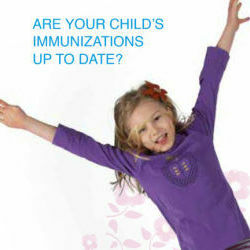 Are your child's immunizations up to date? This brochure is available in multiple languages. What you need to know about childhood immunizations. Vaccines work by stimulating our immune system to produce antibodies that fight infection. The antibodies produced are the same as those that occur when we get a natural infection, but without us having to experience the illness. This helps prevent us from becoming ill if we are exposed to diseases in the future. Most vaccines need more than one dose over time to produce full protection. That’s why it’s important to follow immunization schedules. It gives the best protection with the fewest doses of each vaccine. 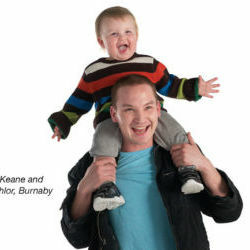 ImmunizeBC has easy-to-read vaccine schedules for all ages, as well as immunization record cards. Vaccines are safe and do not cause autism. This myth has lasted even though research clearly shows it’s not true. Hundreds of thousands of immunized children have been studied over many years and no link to autism has been found. A study that suggested a possible link was proven to be false. Vaccines keep us safe by stimulating our immune system to produce antibodies that fight infection. The antibodies produced are the same as those that occur when we get a natural infection, but without us having to experience the illness. This helps prevent us from becoming ill if we are exposed to diseases in the future. For some vaccines, booster shots are needed because some antibodies reduce in numbers over time. The booster shot reminds your immune system to make more antibodies. Isn’t it too much stress on my child’s immune system to get so many shots at once? No. Your child’s immune system is amazing. In theory, a baby’s immune system can handle hundreds of vaccines at once. Disease weakens the immune system, not vaccines. My child has a cold today. Is it safe to get all their shots? Yes, having a cold is not a reason to delay shots. Your child’s immune system works so well that they can get all their shots even if they are teething, have a fever, diarrhea, ear infection or are taking antibiotics. 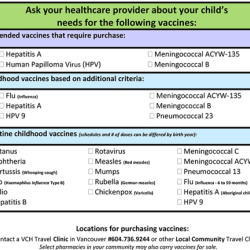 Evidence-based immunization information and tools for B.C. residents. Get easy-to-understand fact sheets, translation support, and more. Vaccines are carefully tested and monitored. They have an excellent safety record. It’s much safer to get a vaccine than to get sick.